Ingenious mesh covers both your iris and pupil with colour while still allowing you to see. Best total whiteout option. ColourVue White Screen are a unique kind of crazy contacts as they do not feature a colourless area in the centre - they are all covered with the mesh pattern, including the pupil. The white mesh covering the whole iris and pupil gives an amazing and striking effect that cannot be compared to anything and goes perfectly with creepy Halloween costumes, various cosplays and themed costumes. The vision through ColourVue White Screen lenses is slightly different than normally, but doesn't cause any problems - it's like looking through a blind. 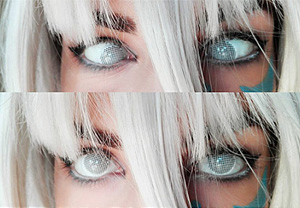 Because of the freaky looks and slightly changed vision, it is not recommended to wear these lenses on a daily basis but they are great for parties and costume events.